On 27 February 2014, scientists cleared the Canadian Navy in Sooke's death. According to Deafwhale Society's earthquake theory, the Canadian Navy was not responsible. 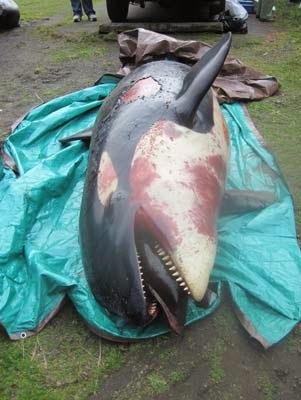 Sooke was found dead on a beach just north of Long Beach, Wash. on 10 February 2012. Her body was battered, bloodied and bruised, and appear as if it were hit on left side by a shock wave or a powerful blast. Sooke was a 3-year-old member of the Southern resident killer whales, which make their seasonal home in the San Juan Islands, 42 miles south of Vancouver City (Canada). On 4 February 2012, at 12:05 pm local time, a magnitude 5.6 earthquake occurred along the Continental drop off, 50 miles west of Vancouver Island, and 146 miles upstream from the entrance to the Juan de Fuca Strait. It is likely that Sooke was swimming south only a few hundred feet from the vertical edge of the drop off when she was hit broadside by a powerful shock wave generated during the seismic process (open this page and then click on Interactive map). The position of this quake at the base of the drop-off would have turned the edge of continental shelf into a gigantic piston moving at lightning fast speed in Sooke's direction. This scenario agrees with the condition of Sooke's carcass. Sooke's pod was spotted in this area at the time of this earthquake. It is possible that Sooke might have received a greater injury than her pod mates because she was further out to sea. 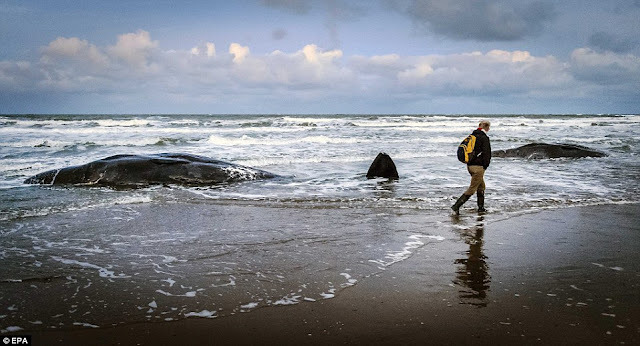 Her pod mates might have been above the drop-off and closer toward shore and not injured at all. Furthermore, killer whales can no doubt detect EQ precursors; otherwise, this species would never be able to flourish in seismically-active waters around Vancouver. But... is detecting precursors a learned skill or a purely inherited instinct? Is it possible that the rest of her pod mates swam away in time and poor Sooke ignored the precursors and hung around a little too long? The surface currents along the Washington coast at this time of year flow generally southeast toward the shoreline and along the coast. Thus, had Sooke lost her sense of direction during the earthquake, she would have swum southeast closer to the coast which agrees with where she stranded. "Although the epicenter was located 30 miles inland, the large shallow-focused Mexican earthquake of 3 June 1932 was felt by many vessels at sea. The S/S Solana, steaming through a smooth sea with light variable winds in water over 4,800 feet deep, 60 miles from the epicenter, experienced strong violent shaking for about seven seconds. Only 10 miles away, the M/V Sevenor experienced less severe vibrations but lasting nearly a minute. Conditions aboard the M/V Northern Sun were entirely different. Although the vessel was 115 miles from the epicenter, vibrations lasting for three minutes became so violent that the engines were stopped. Before the earthquake, the sea was smooth with a slight westerly swell, but after the event the sea had become confused and the swell pattern had changed. Further to the North, 130 miles from the epicenter, the S/S Arizona commenced to vibrate and continued to do so for about 75 seconds. The aftershocks continued for many days. Ship reports indicated that during the next 36 hours several strong seaquakes were experienced in the area. The M/V Silverwillow began to vibrate dangerously in every part and at the same time began an uneven short pitching motion followed by heavy rolling. The disturbances commenced at 0530 GMT on 4 June, and the rolling continued 15 minutes. Seven hours later at 1245 GMT the crew aboard the S/S Talmanca heard a loud noise like distant gunfire, then experienced severe vibrations, and at 1337 GMT two similar gunfire reports were heard again about 10 seconds apart but there were no apparent vibrations. However, 20 minutes later the sea surface was littered for five or six miles with small dead fish. Several hours later, the S/S Hanover reported violent shocks that "rocked the ship as a nearby explosion might." Fifteen minutes later two more shocks were felt."